"A dollar from every Catholic in the world"
Recently released from Grindhouse Releasing is a dream for exploitation and crime film lovers over the world. Gone with the Pope is an unfinished film that took Oscar winning editor Bob Murawski (Spiderman) 15 years to complete. With missing film elements, no script and the director/writer/star deceased, it is amazing that this movie ever came to be. But God bless (no pun intended) the folks at Grindhouse Releasing for making this happen. 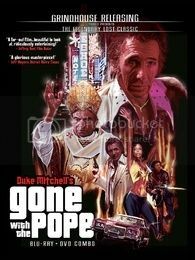 Gone with the Pope stars Duke Mitchell, a well known crooner who decided to try his hand at film making. He plays Paul, a gangster who was recently released from jail and is asked to do one last job before retiring. After the job is done, and before the mob (who hired him) can whack him, Paul gets a few of his ex con buddies to join him on a boat cruise to Italy to live it up with his recent wealth. He then unloads his plan to kidnap the Pope with a ransom of one dollar from every Catholic in the world (after realizing how many Catholics there are, he kindly lowers the ransom to fifty cents. What a guy! ).